Affordable Accoutrements: A Table in Winter! I walked up to the main street, and conditions are beginning to improve. I snapped this picture of the front of the house on the way back. Next came hot chocolate (not from a mix) in front of the fire ... so soothing on a cold Winter's day! I'm going on the assumption that the party will still happen. No one has called to cancel. I set the table for you in the sunniest room of the house. I used dishes that have been sitting in the little china cabinet next to the table. They've been patiently awaiting their turn to used for a tablescape post. People often ask where I store tabletop items when they're not in use. I wish I could say there's a huge, centrally located, perfectly organized dish room. Unfortunately, there is not. On the plus side, the house offers a lot of storage space. China, crystal, and silver can be found in kitchen cabinets, mudroom cabinets, in five different pieces of furniture, and in seven closets. Flatware chests and boxes containing dishes and glassware are labeled by pattern (in case I get hit by that proverbial bus). I kept today's table very basic: no table covering, no ornaments, no fruit or flowers, and not even one serving piece in sight. The centerpiece is a single candle on a footed ceramic compote. The cabinet against the wall is where today's dishes normally reside. I used clean-lined glassware from the bar in the next room. I want today's table to have a modern, uncluttered feeling. I did, however, use china that can probably be described as vintage. It's Lace Point by Lenox, introduced in 1978. "Vintage" is one of those words that gets tossed about rather freely these days. Most sources seem to indicate that vintage items are anywhere from 20 to 100 years old. One hundred is the point at which something becomes "antique." But with cars and furniture, it's can be less (except in Europe, I think, where furniture can't be called antique unless it's reached the century mark). I'd be interested in hearing your opinions on criteria for items being vintage vs. antique (vs. merely old!). I usually prefer silver flatware, but stainless seemed appropriate today. This is American Harmony by Oneida. I like the way it seems to bridge the gap between traditional and modern design. It's a nice weight and quite affordable (especially when it's on sale). Belk currently has a 45 piece set (8 place settings, plus serving pieces), regularly priced at $110, for $79.99. If you buy the 45 piece set, you get a 20 piece service for 4 for only $1! Read about it HERE. A closer view of the patterns. I like the subtle soft pinks and grays (grey in the UK? ), the sylized floral pattern, and the wide platinum-banded rims. It seems to me that the cool tones of the stainless go well with the platinum trim of the china. The glassware is basic, but oversized, which makes hosting easier ... fewer refills required! The artwork, mostly watercolor paintings I did a few years ago, is colorful and has a tropical feel ... although the reference photo I worked from for the floral is one I took of lilies in West Tennessee. I just added lots of bold colors for a lively background. My tastes usually run to more muted shades, but sometimes it's good to step outside our comfort zones, isn't it? I chose to use these candleholders because the colors remind me of the ones in the china pattern. They came from a local thrift store (around fifty cents for the pair!). The griffin design appeals to me. Griffins, as you know, are legendary creatures with bodies of lions and heads and wings of eagles. In antiquity, they were thought to be guardians of treasure. Perhaps I'll store them with my favorite china to keep it safe from harm! First, of course, I'd have to pick a favorite pattern! The candle reminds me of a paper lantern. It glows softly when it's lit. The compote is by a local artist. One of his tradmarks is pressing his thumbs into the clay before it's fired. I like the organic feel and earthy colors of his work. The candle came from Goodwill. I enjoy mixing thrift store items with original art and estate sale finds. It keeps tables affordable, but eclectic and interesting. The late afternoon sun's coming in now ... and we have an observer! He's the neighborhood cat, KK (our neighbor named him ... short for Kitty Kat). He lives mostly here and at her house ... he used to patrol the entire neighborhood on a schedule you could set your clocks by. Don't worry ... he has a warm place to go at night (or whenever he wants). I think he really prefers being outdoors. He got bored watching me set the table and started grooming himself in the sun. The sun's sweeping across the old tile floor now. It's not a fashionable floor, but I still like it. I like the creamy color of most Lenox china. When the sun shines in, you can see how transluscent it is. The glassware consists of oversized red wine goblets and tall pilsner glasses. The wine glasses are from an antique shop (but not old), and the pilsners are Bormioli Rocco Amadeus 13 Ounce Palladio Footed beer flutes. They're available on Amazon.com. I found these new-in-the-box at Goodwill for a really good price. I like using pilsner glasses for water and iced tea ... or for any iced beverage such as Mojotos or Harvey Wallbangers (anyone else out there remember those???). Another view of "the guardian." The sun's beginning to set and warm light fills the room. These glasses are lead-free and dishwasher safe (but I think they're too tall for most dishwashers). I hand washed these and dried them with lint-free towels before setting the table. I knew the sun would tattle if I left any dust or water spots! You know what it's time for now, don't you? This one's been burned so often that the flame is low in the candle, and it has a nice soft glow. I found a fascinating short video the other day on howstuffworks.com. It's about "How Bone China Works," and features a tour of the only US manufacturer of fine china, Lenox. The pattern below is applied as a decal. The video shows the process using "Winter Greetings" in the demonstration. You can watch it HERE. I like the warm colors of the table setting contrasting with the cool blues of the snowy deck. When the water glasses are filled, and there's red wine in the glasses ... you and the other guests will sparkle in the glow of the flickering candles. Drive carefully ... see you soon! Please join Susan and all the talented tablescapers for Tablescape Thursday! Great table! I had to laugh at "vintage 1978" -- that's the year Howard and I got married (I was still in diapers of course!). Love that Lenox -- gorgeous. Beautiful table ... and I do like that stainless; it's a nice classic pattern, and bridges traditional and contemporary very well. Good buy, too! We have the same taste in silverware and cutlery. First it was the South Seas pattern and now the Harmony which I also have. I love beer in a pilsner glass. Icy cold. You really got the shot right with the candlelight sparkling. My 7 year old just came up behind me as I was viewing your photos and said "Ooo, that's beautiful!" 'Nuf said. My favorite parts: the table by candlelight, the oversized clean lines of the glassware, the thrift store finds in the mix, and your beautiful "tropical" artwork which is very warming on a cold day. To add my two cents on the vintage vs. antique debate, I was taught that antiques (50 or older) were things of intrinsic value while vintage (20 or older) were items with a pop culture or kitsch appeal. I could be completely wrong, but that's what I was told. What a clean elegant table! Love the overside glassware. Everything is just stunning. This is such an elegant table, Bill. I do believe you could make paper plates and red solo cups look elegant and smart. I love every single thing about this pretty table. Everything is always SO gorgeous. I'm a thrift store (Goodwill, etc) afficianado, too. Thanks for a welcome visual treat on a cold gray day in Texas! Love the room, the table, and the paintings! You achieved your goal..big time! And you are early too! Mine is still a concept.. Anyone over 50 is vintage..to the young ones, we are antiques! Love the use of the pilsner glasses. Very unique. And that candle is awesome. I love this table, Bill. So simple and elegant! I am not so great creating my centerpieces so it was nice to see that you don't always need something elaborate to make a pretty tablescape!! I like all of your pieces, the china is just beautiful. I also like your photos taken in the evening with the soft candlelight glow. What do you do when your not doing these beautiful settings ? Can I please have a cup of coffee while I'm here? black no sugar, or should we crack open a bottle of bubbly, let's celebrate Susan's party. Bill, it's just lovely (even without the Girls)...so cozy...very pretty room and you really are a talented artist. And since it's been a while since I've been by...your profile pic is very handsome! I like the cleaner look - another beautiful table. Really like the china - beautiful. Sounds like I need to travel to find a better Goodwill. :-) Look at that sweet face looking in the window - pretty cat. You got more snow than we did. I was glad to see it go. Your home is beautiful tucked in the snow...your tablescape is always stunning...bj...I believe 30 years is vintage...100 antique...or so says Texans. to each his own idea on that. Beautiful Bill -- you charm us week after week. I do a lot of Goodwill hunting too, but we just don't see the kind of pricing you seem to find. We got the snow too and it seems to be waiting around for more predicted for this weekend. The only good think about being snowed in --- is more time to play with the dishes! Oh -- I forgot -- I've heard the "new" age for antiques is 50 -- that's probably a testament to "they just don't make **fill in the blank** like they used to" --- maybe it's because they figure the newer products won't last much longer than 50 years? Where to begin. Your house is as gorgeous on the outside as on the inside. I love the fact that I always learn something when I read your posts and your photography is so professional, I feel as if I'm reading a decorating book when I read your blog. I guess that means I'm a fan. As usual your table is so pretty. Love your space with the tile floor -- who says it's outdated -- it looks perfect to me! And the Ilove the china with the simplicity of the glasses and the fact that the centerpiece was kept simple. I always eagerly await your next table post -- you do such a good job! You have totally outdone yourself with simple elegance. Thanks for sharing. Have a blessed week! Again & again & again....how DO you do it, Bill??? Totally outstanding TT & I didn't see one single water spot on those glasses. Incredible job! I have the same flatware, too! Always a classic. When I bought it, they told me it would be fine in the dishwasher if I didn't use any lemon or gel dishwashing detergents. They were right. I've had it for about 15 yrs. & it still looks like new. Thanks for showing us a view of your lovely home from the front. It is beautifully situated & looks so pretty surrounded in white. Simple elegance indeed! You always have something special for us, Bill. Loved seeing your home in its setting on this snowy day. I agree that 100 years is antique and vintage is usually around 30-40 years in my mind. Happy Tablescape Thursday. Very beautiful, as always! I love those big pilsner glasses! Those are great! I've always read that "antique" is reserved for items over 100 yrs old and "vintage" is for things that are at least 50 years old....but personally, if it's at least 35-40, that's vintage to me, (including myself, being 39, LOL!)!!! I love this post. It is a lovely photograph of the house with the snow to start with. I love the table is the pattern inlaid into the wood? Grat painting on the walls. Love the GREY and pink pattern in the china. The napkins are wonderful, you certainly get a few bargains. I would love to buy the cutlery but the postage wouldn't be worth it from the USA. I love the Oneida beaded style cutlery we have some which you use all the time, sadly I don't have any silver flatware/ cutlery except fish knives and forks. I love the way the NEIGHBOURHOOD cat comes and visits you. The compote you have used as the candle holder is wonderful, as is the candle that would look great on a table set for a Chinese New Year meal as it looks like a Chinese lantern!! The sun, the candle light adds to the wonderful ambience. I feel a lot more relaxed about this tablescape than the one you did two weeks ago, melancholy, which made me feel that you were feeling down!! Hey Bill! Glad you survived the winter storm of 2010! The roads around here were terrible from the time the snow started on Friday until late Monday. A fireplace and cup of hot chocolate sound wonderful! That china pattern looks a lot like what I saw in a thrift store yesterday. They only had two plates (Lenox)and had a price of $4 each. I debated on whether or not to get them, but decided not too since they only had two plates. KK is one tough cat! It seems like my mom's cat would rather spend time outside these days which I find odd because he used to be an inside only cat. Oh well. Cats are definitly funny little creatures. Hope you are having a good week! Hello brother! Your table is so beautiful. The pattern of the dishes is amazing! The candle light also adds that something extra that makes me smile!! Just beautiful!! Beautiful table Bill, I love everything about it. Wonderful china pattern. I bet you spend allot of time in that wonderful room, if I had one, I might live in mine. Thanks for sharing. Beautiful, as always, Bill. As much as I love the table, I LOVE the setting...the warm sun room overlooking the snow through the windows. I can just imagine sharing a meal with good friends, good food, and good conversation. You also brought back memories...Harvey Wallbangers. Boy, I felt so grown up ordering one of these...with my fake ID, of course. It may be simple, but it sure is elegant! Love the china. Just lovely! The paintings on the wall are beautiful. The simplicity of your table really lets the beauty of your dinnerware come through. So gorgeous. Everything just sparkles. Really elegant. Nice to see your house and the snow! Did you build a snowman? Pretty tablescape! Love the Lenox china! I enjoyed your photography, great shots! P.S. - My grandchildren call me "KK!" So this is simple. I need to go back and start over, lol! Beautiful and elegant as always. I also have that stainless pattern and chose it because I love it's elegance. I had always thought that "vintage" applied more to linens, clothing, china, etc., of a certain age and "antique" referred more to furniture and "heavier" things. Wow..I felt like I was sitting at your table. Enjoyed your conversation and the Tablescape. Wish we had your snow....we only got a dusting here in South TN. First, let me say I just love the outside of yor home! It's gorgeous and charming! The table is so lovely, the glassware just sparkles! You are so talented at table designing! HAGD, Cindy (where the road conditions are crappy all winter) hehe. Hi Bill, Everything sparkles and shines and it looks so nice. As always. What a great table. You always have amazing tables. This one, however, looks like you are ready to serve and have a hearty meal with good company. No table cloth for guests to worry about spilling on or any extra dishes. The Griffin candleholders are fantastic. And thank you for sharing your secret of "storage"; maybe there's hope for me yet! Bill, before I even saw the first table picture I knew I was in for a treat and I was not disappointed. It's another beautifully thought out and executed tablescape! I love the china and glassware, and how pretty is that flatware, and such a good price! We have a Belk close by so I may have to buy some! And your pretty bargain candleholders are the perfect shade as you said. And your artwork is wonderful! I also love the pictures of KK keeping an eye on things...cats are so curious! I tend to think of anything antique as being over 100 years old, but vintage can be anything that inspires a memory from your past! Hi Dear Bill! Oh, I do hope you're keeping warm with all of your snow. You have such a lovely home and your picture would make a pretty Christmas card. Now your table...so beautiful! Love your china and nothing is ever simple with you! :) That's a compliment. You have such an eye for setting a gorgeous table and this one is no exception! Just gorgeous. I love the updated elegance of a table without the cloth. I hope your guests appreciated the setting! Hi Bill, love your tablescape, especially your china. Love the shots of the kitty too. Keep warm my friend. OMG, Harvey Wallbangers! I haven't had one of those since forever. I think I just answered your antique and vintage question! 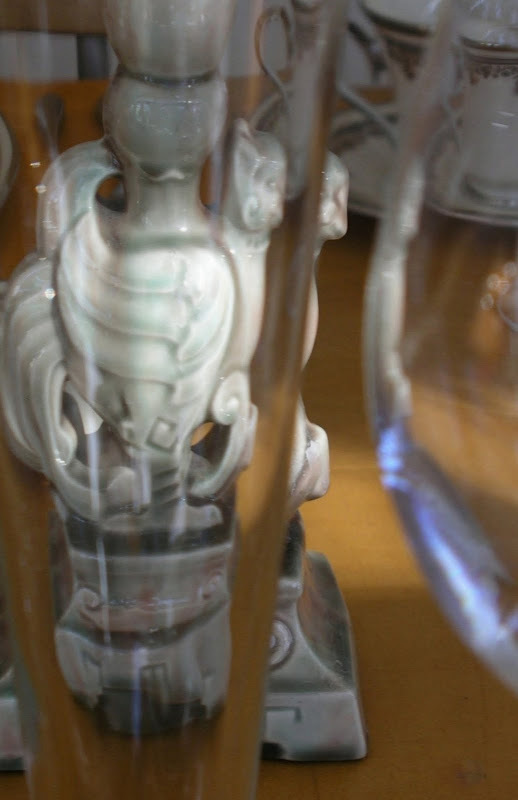 I love everything about your post from the dishes, stemware, candles, griffins, how bone china is made to your cheerful art work. I could go on and on; exciting is the only word I can think that captures your post. As always, fabulous!!! I cannot believe you purchased the candle holders for .50 each. They are beautiful. The entire table is stunning. I can tell KK is so proud to be your neighbor. P.S. I did end up getting what the boys had. Only I didn't feel the symptoms until 2 hours into our flight home...yuck. Nevertheless, its great to be back home. Wow Bill, I really love this tablescape today-so fresh, uncluttered and sophisticated. Your mix of old and new is just perfect too. Doesn't everything look so different and night-just beautiful! Brrr, I got a chill just looking at the snow! Could it be? Has our Bill become a minimalist? ;) I would call this tablescape understated elegance, dressed for more casual entertaining, yet elegant and refined. I love your artwork too. Please show us more! I'm not back to blogging yet, but still visiting my tablescaping friends! I'm new to Tablescape Thursday, but it only took me one week to determine how well respected your style is to the followers of this blog. And I see why! Thank you for the clean, simple display this week. I vacillate in my own decorating between dense tables and uncluttered ones. I have bookmarked your site for further ideas from you. Thank you! Hi Bill, Truly an elegant, beautiful table. AND I adore your dining room /sun room! KK is thinking it would be a nice, warm and classy place to nap! We can always expect a beautiful setting from you! Love your tablescape observer. :-) I really like the floor of your sunroom...so glad you haven't ripped it out and replaced it. Vintage...ummm, I reallllly hope vintage doesn't start at the 20 year mark because that would make me vintage. LOL Beautiful tablescape...thanks for sharing all the places you stash the good stuff! :-) You are so organized. My family is on their own if I get hit by a bus! Ha! Just beautiful, everything is sparkles and shines in that light to create a welcoming setting. MY CHINA PATTERN! You did a beautiful job with it, I married in 1981, I haven't broken a piece yet and use often. I love how you have used it. I may have to have a formal dinner this weekend! Or with my Valentine of 29 years. Bill, Another beautiful table. Your home is lovely all covered in snow. I am an antique dealer and I have always been told furniture must be 100 years old to be considered an antique. Glassware, silver, china, ect. over 50 years old is also considered an antique and items are considered vintage when over 20 years old. Bill, long time no visit... again! Been buried with lots to do. Anyway, done up or simple, your style is simply "to drool over"! I love that dinnerware and your choice of glassware is great! I'll do that one of these days... Gotta reclaim my table so I can do some tablescapes soon. Like today for some V-day fun! Love that pic of your place, it's pure wow! Bill, this is just stunning! I love the shot of the candles with the snow outside. You really know how to romance a camera. Amazing shots. Wishing you a Happy Valentine's Day, filled with love overflowing. You deserve the best! What a beautiful setting, and a beautiful house! Lovely vintage pieces! I am a new visitor to your lovely blog. I have enjoyed looking through your inspirational posts and my goodness you set a beautiful table! I also wanted to let you know that a very good friend of mine, who is an incredible hostess, stylist, and photographer mentioned to me the other evening during one of our very long distant chats, what a warm, friendly & talented gentleman you are. She told me the other night that you had set a place for her at one of your tablescapes and went so far as to have a placecard with her name for her to see. That was so thoughtful and meant so very much to her. She would have loved to have had a place at your table. I look forward to stopping by again soon, I so enjoyed my visit. Oh and by the way...my friend that I mentioned is Coty Farquhar. Your tablescapes are always works of finely assembled appointments for the table…and always beautiful. It seems that the first I noted the word vintage had to do with wine production. If things were “of a certain vintage,” it implied that it was related to a harvest of fine grapes in a particular year, that yielded a distinctly fine flavor. Then vintage came to denote things of a certain age or from a certain era ,ike the 1930’s 1940, and even 1950’s; but lately vintage is used for anything that seems to be out of date,, and this might be anywhere from 20 years and above. I prefer to think of things as vintage if they are about 35 or more years and have some design distinction, characteristic of the decade it was made. Antiques, of course ,should be at least 100 years old. I loved your table, it's so beautiful. I wish I was your neighbor and the pictures are so great, they make me feel like if I'm there. Is it the camara? or did you take a photography class?